We wake up, pack our stuff and head down to the main lobby, where we’re greeted by several familiar faces. Bankshot, who we first saw at Shelter Cove and who was very friendly with us, is hanging out. We invite him to join us at our table. We also see the trio who left Ollalie Lake in the pre-dawn darkness: Monique, the kiwi, Bert, the Belgian and their American friend with the sasquatch beard, Todd. And many more who we haven’t yet met, all hungrily awaiting the opening of the buffet. Finally, stomachs stretched to the bursting point, we lumber out. We have to get our resupply box and pay the bill. I tell Bankshot about my blister woes and he offers to give me some of his Leukotape, claiming it’s even better than duct tape. My blister feels better this morning than it did last night, but I’m still dreading hiking on it all day long. I take him up on his offer. He pulls a huge, misshapen roll of flesh-colored tape out of his first aid kit and I proceed to tape up my toe and both my heels right there in the lobby of the lodge. Down at the shop where we’re getting our resupply box, there are skiers preparing for a day on the slopes. I find this incredible — there are people who are so crazy about skiing that they will do it in mid-August on a single slope on the side of a dormant volcano. I suppose some of these people are professional skiers and so they have to train to maintain their edge, but even so it boggles. I have come to realize lately that I don’t like downhill skiing that much. I’ve always just done it because it’s what you do in the wintertime. I watch them trudge up to the lift in their unweildy boots, their equipment balanced on their shoulders. I’m so happy to be shouldering my pack instead, heading off on my two feet and not two planks of carbon fiber. Finally, at about 10:00, we hit the trail. As we leave the lodge, we see Mount Jefferson in the distance, the one we missed because it was shrouded in clouds and rain. The one that got away. We will have to come back some other time and re-do that section. I was thinking that the trail would be all downhill from here to Cascade Locks, but it turns out that’s not the case. 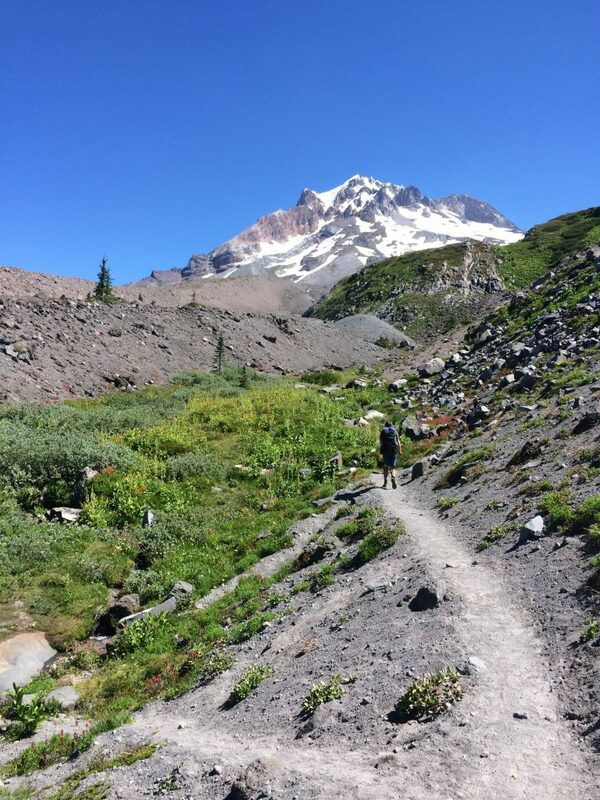 It’s a hot day, and we’re attacked by nasty biting flies as we wind our way in and out of the gorges that are cut into the sandy sides of Mount Hood. The views are still beautiful. There’s a lovely cool glade at one point, free of flies, a gentle downhill. My feet feel okay! The leukotape seems to be working! I’m going to make it to Cascade Locks after all! After about 10 miles, we hit the junction for the Ramona Falls alternate trail. 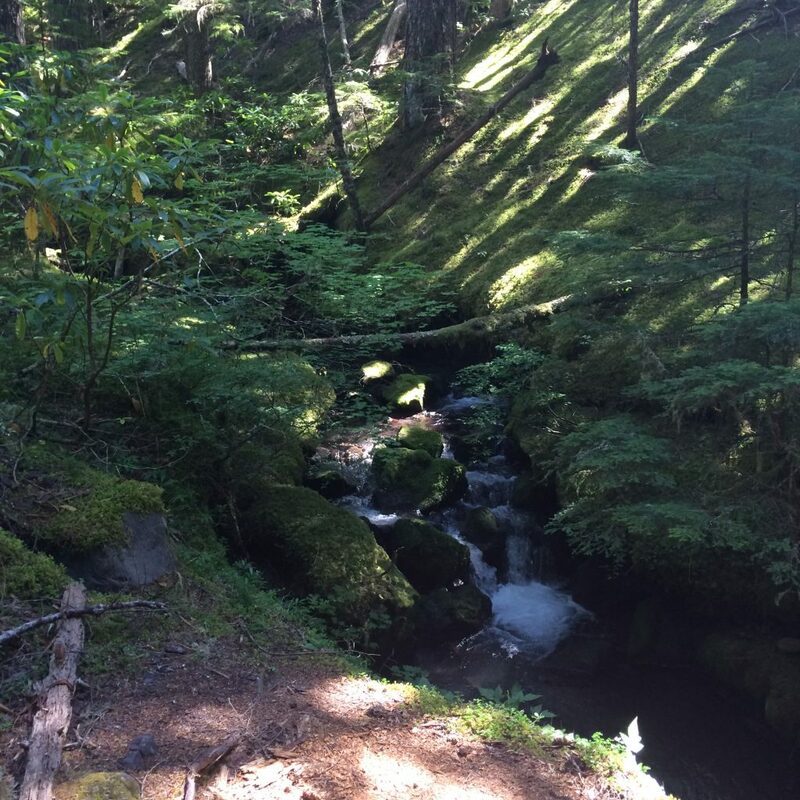 It’s about the same length as the regular trail, and takes you by a big waterfall and along a creek. We take the alternate and reach the falls, which are truly spectacular. The temperature also drops by about thirty degrees, which feels fantastic. I’m tired and wanting to take a long break here, but Marc is ready to go after about five minutes. I can tell he’s eager to get to the end of this hike. 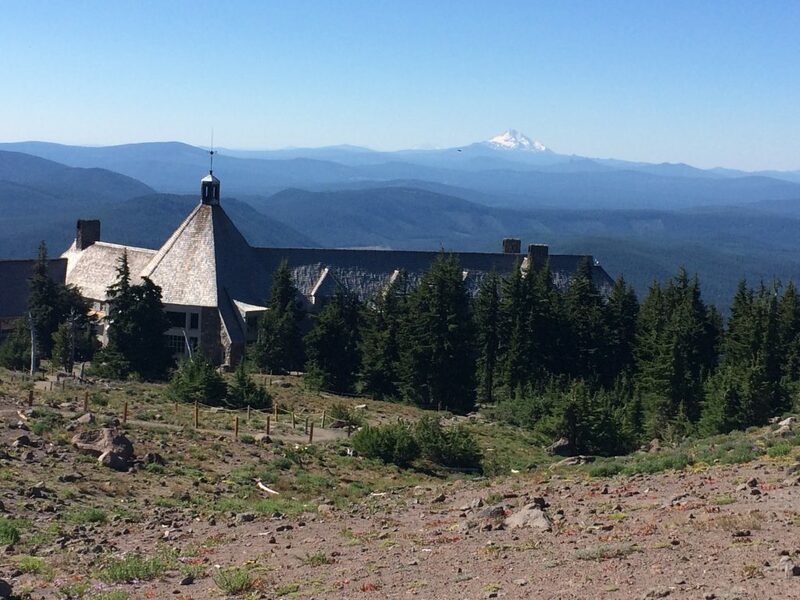 We chat with a dad and his daughter who are circumnavigating Mount Hood. 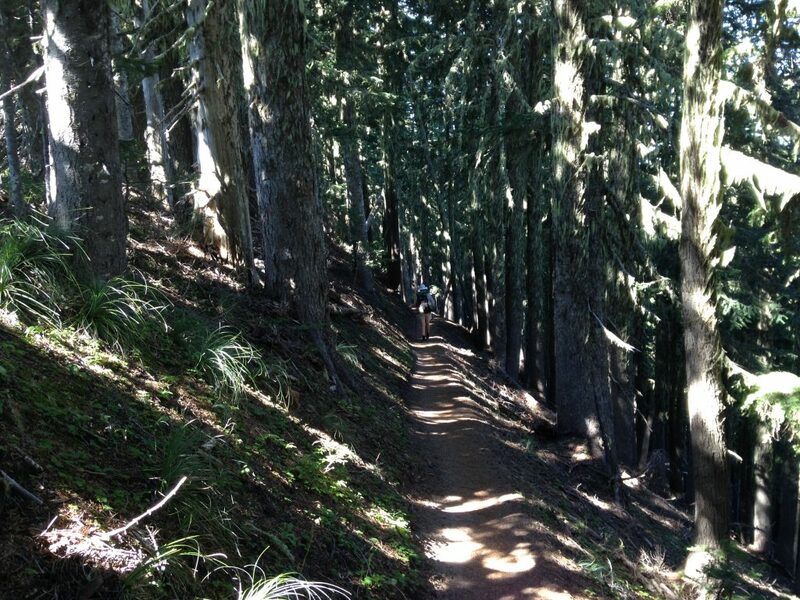 He apparently did the PCT way back before Cheryl Strayed, when no one knew what it was. He tells us we should go up and around a different way, but I just nod and ignore him. We’re sticking to the route here. I’m not interested in going uphill any more than strictly necessary today. It’s super hot. 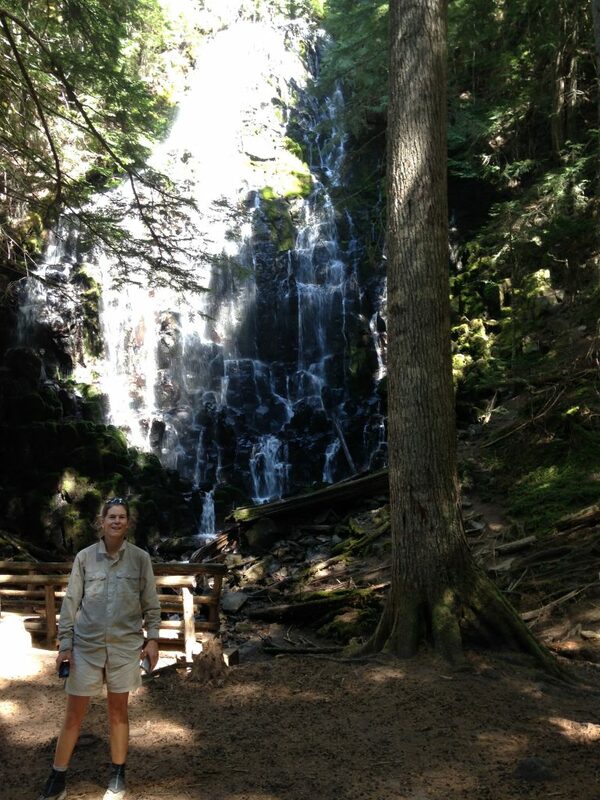 Here’s Ramona Falls and the lovely mossy creek afterwards. We’re still not exactly sure when we’re going to exit this trail. At Timberline, I had called my friend Margaret, who had agreed to fetch us in Cascade Locks on Monday, and asked if she could come on Saturday instead. She said she would check and get back to us. I haven’t heard yet. I was kind of thinking that today we would hike about 12 miles or so and call it a day — there is a tent site at 2016.5, where the Ramona Falls trail hooks back up with the main PCT at the Muddy Fork River. We get to the river, which is raging from snowmelt off Mount Hood, and see a big fat log with rope attached to it and a smaller log underneath it. We have to somehow get across this thing. I inch my way across, tummy tucked into the log in front of me, sliding my feet in a kind of crab walk along the lower log, grabbing onto the rope and hoping it won’t break. Marc looks up and down the bank of the river, trying to find some other, any other, alternative. He’s not overly fond of bridges. Finally he stashes his poles in his pack and starts across. He made it, too. Of course we decide to keep going. The trail heads uphill in the heat, but at least it’s in the shade. My feet are tired and sore, but the leukotape seems to be doing its job. The blister under my toe isn’t killing me and my heels are not on fire. At the next possible tent site, a dry one, at Lolo Pass, we stop and take a break. We don’t really have enough water to camp here, and there’s another tent occupying the site anyway. There’s a potential tent site and water source just up the trail, after a nasty clearcut type area, with power lines overhead. But it turns out to be just a teensy, icky spot down below the trail. Despite how tired we’re I’m getting, and how late it is, we decide to keep going. The app says there’s another tent site in about four miles. That’s an hour and a half. It will still be light. My feet are okay. On a ridge, I get a cell signal and try texting and calling Margaret. I get through, and she tells us that her family obligations are such that she can’t ferry us this weekend. Well, I think. That’s that. We’ll figure it out when we get to Cascade Locks. As we hike I compulsively check my app to see how far we have to go to get to the tent site and praying that it’s not already occupied. The app says there’s a water source just a quarter mile down the trail from it. There are all sorts of threatening signs on our left telling us it’s a watershed and that there’s NO TRESPASSING. Even if we wanted to tresspass, there aren’t any likely spots to pitch a tent. So we keep going. We get to the tent site and it’s occupied by two weekend warrior bros (you can tell by the body fat percentage) who have spread their stuff out all over the place. They have a tent on one side of the trail, and on the other, they’ve strung up a hammock and a tarp and are cooking their dinner. I look around in a kind of panic saying to Marc we could put the tent here, couldn’t we? and one of the guys says that there’s another spot just a ways further up the trail, with water and some tent sites. They had gone up there to get water, themselves. We’re not impressed by their warm welcome, so we leave. It’s only about a quarter of a mile up to the spring, but it’s getting kind of late. We take the turnoff to the spring and find the site occupied by three tents. But these are all thru-hikers and they say SURE, join us!! It’s a party! We pitch our tent. Monique, Bert and Todd are here, along with a couple of southbounders. After such a blazing hot day of hiking, I’m particularly glad we don’t have to dry camp. I can sponge bathe my sweaty sticky body, although I have to do it rather modestly given that we’re basically in a locker room, what with all the other people around. We get ourselves sorted out and are just about to go into the tent when another hiker arrives. She finds a spot near Monique and Bert. We all rant about the weekenders. In the tent, I do some calculations. We could finish tomorrow. It will be a long day, but it’s totally do-able. This hike is almost over. 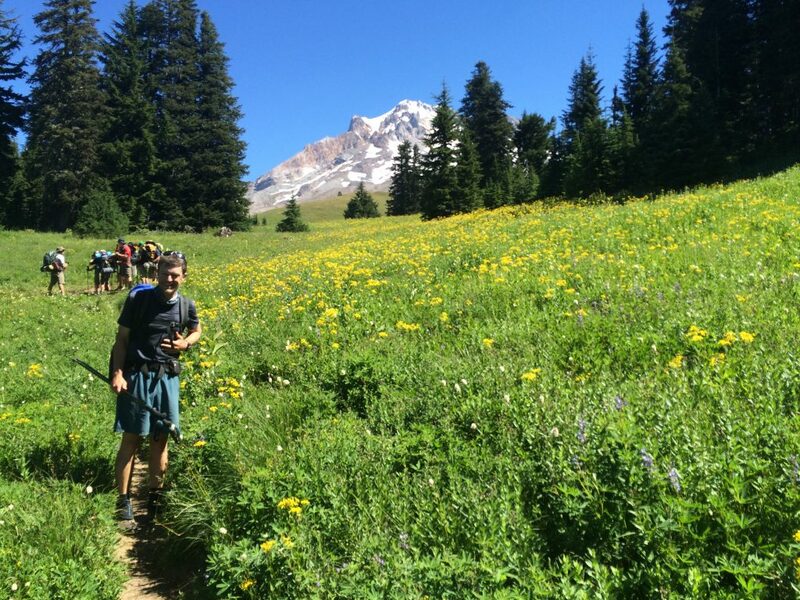 This entry was posted in Hiking, PCT Oregon 2016 and tagged backpacking, hiking, Mount Hood, Pacific Crest Trail, PCT Oregon, Timberline Lodge by gydle. Bookmark the permalink.